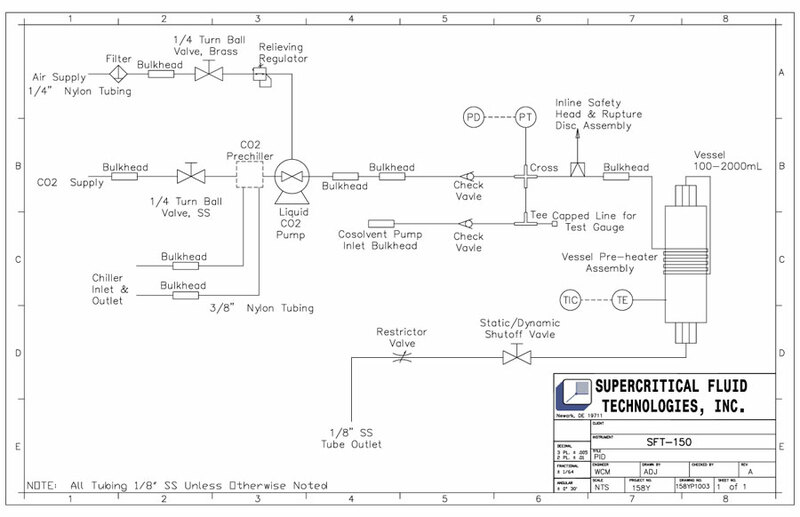 The SFT-150 Supercritical Fluid Extraction System has been developed to investigate the feasibility of applying supercritical fluid techniques to various analyses and processing situations. The SFT-150 makes this possible without incurring the larger capital investment required for our more automated and integrated systems. Whether it’s repetitive laboratory extractions or process development and optimization, the SFT-150 provides an excellent introduction to the power and versatility of Supercritical Fluid Extraction technology. 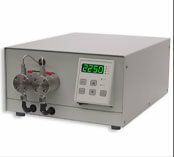 The SFT-150 System is a fully capable instrument, designed to perform extractions in a supercritical fluid media. It offers the flexibility and safety features often found only in higher priced extraction systems. The modular design of the SFT-150 makes it easy and cost effective to alter the unit’s basic configuration, adapting it to meet new or evolving application needs. It is possible to upgrade the capability of the SFT-150 to match much of the functionality of the SFT-250 SFE System. At the heart of the SFT-150 System is a stainless steel vessel capable of containing supercritical fluids at pressures up to 10,000 psi (68.9 MPa). The SFT-150 is unique in its ability to accommodate pressure vessels up to 2 liters in capacity. A larger processing vessel enables the user to extract very low levels of key components from materials or process larger amounts of bulk material than would be possible with conventional, analytical scale SF equipment. The SFT-150 incorporates a high performance, air driven pump which can rapidly produce the high pressures required for supercritical fluid work. Flow rates range from 1 to 330 ml/min (250 grams/min) of liquid CO2 under typical operating conditions. Interlocks provide safety precautions, preventing over-temperature or over-pressure conditions. As an additional safety precaution, rupture disc assemblies provide mechanical protection against accidental over-pressurization of the system. Side and front panels allow easy access to the pressure vessel, valves, fittings, and electronics. Manually operated valves provide long term, maintenance free performance. A robust, variable restrictor valve (back pressure regulator) provides precise control over flow rates, which is essential in obtaining highly reproducible results from run to run. While carbon dioxide is the most commonly used solvent, with modification the SFT-150 allows the user the flexibility to work with a variety of supercritical fluids.The extract collection options include solid phase extraction (SPE) cartridge(s), solvent filled vessel(s), EPA vials and fractional cyclone separator(s). Extract is collected outside the main enclosure. This provides direct access for the user and simplifies the interfacing of the SFT-150 to other instrumentation. 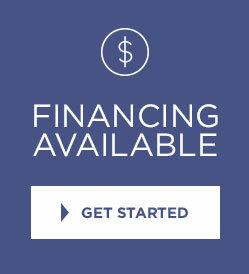 Additional collection options are available. The standard setup is for collection into EPA vials. The SFT-150 SFE System’s pressurization is controlled by an air regulator which regulates the amount of air supplied to the pump, allowing “dial in” pressure control. A PID temperature controller allows for the control of the fluid temperature in the unit’s vessel. In addition, an optional co-solvent addition module may be added to the SFT-150. Pressure Display: LED. ± 1 psi. (6.9 kPa). Temperature Display: LED. Displays internal vessel temperature. Flow Rates: Up to 250 grams/min. (330 ml/min.) liquid CO2 under standard operating conditions. 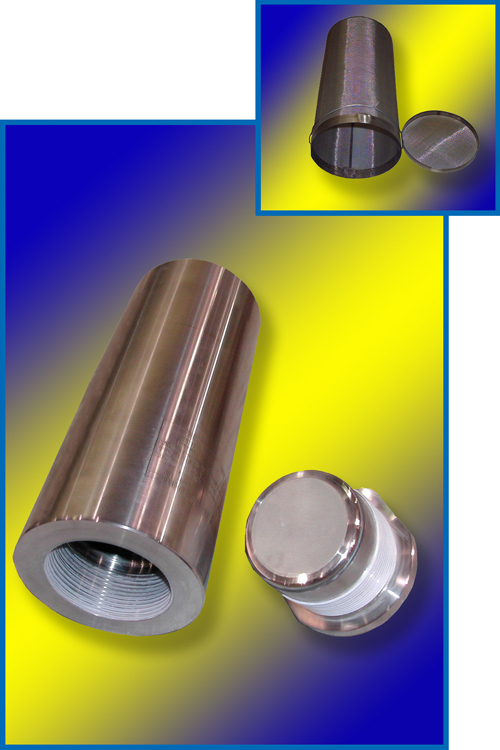 Restrictor Valve: Heated up to 250˚C; resistant to blockage (factory set to 80°C). Extraction Vessel Size: Up to 2 liters; vessels are user interchangeable. 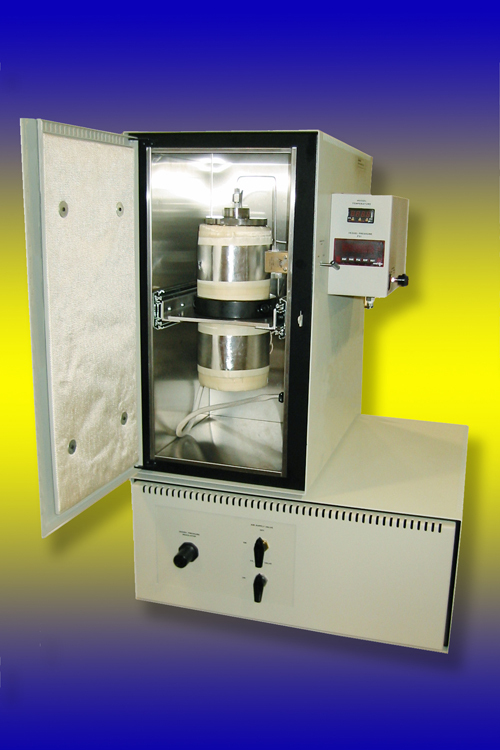 Heating Power: All extraction/reaction vessels are heated with band heaters (2000 watts max.). Dimensions: Width: 61 cm, Depth: 61 cm, Height: 96 cm. Weight (excluding vessel): 60 kg (130 Lb). Co- solvent Addition Module: Manual doping or direct, in-line metered addition. Pre heater: Improves temperature consistency of the fluid in large vessels by heating the fluid before it reaches the main pressure vessel. Recommended for all extraction systems. Power Requirements (U.S.): 220 VAC., single phase, 15 amps (International power available).